Whereas scholars once lauded the utopian possibilities of cyberspace to dissolve embodied markers of gender and race, Jaishree K. Odin argues that a paradigm shift is now required to bring attention back to ‘the embodied status of the human and the situated nature of experience’ (p. ix). Hence, in order to interrogate theoretical conventions that confine us to machinic, technorationalist constructions of the human (and the masculinist and Western-centric assumptions on which they often rely), Hypertext and the Female Imaginary contends that we need new ways of imagining being and subjectivity in all their complexity, fluidity and fragmentation—a task to which electronic media lends itself in extremely thought-provoking ways. This shift, the book suggests, involves conceptualising contemporary social life as a complex ‘topological space where different worlds intersect at different levels’ (p. ix), and where narrative spaces can be opened up for multiple ‘other’ stories to surface. It is this that both Odin and the female hypertext authors, artists and film-makers explored in her book do with considerable insight and ingenuity. Indeed, the book's most important and suggestive contribution is its critical investigation of the exciting possibilities afforded by new media to imagine gender and cultural difference beyond mainstream, disembodied and technocratic narratives. Providing a cogent account of the ways early postmodern authors, such as John Barth, Italo Calvino and Jorge Luis Borges, employed reflexivity, fragmentation and multiplicity to critique meta-narratives of all kinds and smash ‘the mirror of representation into pieces’ (p. 12), Odin's introduction captures what was so innovative about these authors’ work. Yet she also illustrates how their ability to represent ‘multiple worlds, worlds within worlds, interweaving of worlds, colliding of worlds, and textual labyrinths’ (p. 13) was limited by both the physical constraints of their medium and their frequently gender-blind perspectives. 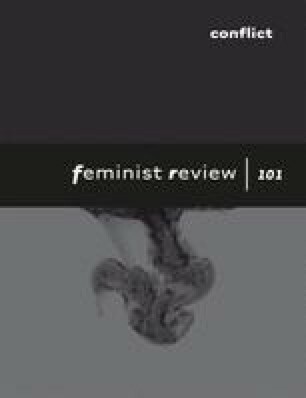 Odin offers a fascinating account of what women's filmic and electronic hypertext works can do to enhance such ‘non-representational’ strategies and to unravel their gendered and inter-cultural implications. In her chapter on ‘discontinuity’, Odin considers how critically aware minority writers and film-makers have used discontinuity and fragmentation to create narrative spaces with gaps to give voice to stories that have been elided or misrepresented by dominant neo-colonial and patriarchal narratives. In Trinh T. Minh-ha's films Reassemblage (1982) and Naked Spaces (1985), for instance, ‘the blanking of visual and aural space is done intentionally to provoke the viewer to think’ about ‘the multiplicity of the cultural matrix’ (p. 51). The chapter on ‘fragmentation’ explores how, in both Judy Malloy's Its name was Penelope (1993) and Shelley Jackson's Patchwork Girl (1995), hypertext is exploited to ‘create a web of interlinked text that the reader can access in multiple ways’ (p. 57). As such, both works ‘open up the patriarchal culture from within, showing how it is comprised of heterogeneous discourses that speak through the gaps in interstitial spaces’ (p. 71). Furthermore, in her chapter on ‘multiplicity’, Odin examines how, as electronic literature has evolved, practitioners have explored how the medium, and specifically interface design, can contribute to representing—and indeed producing—complex circuits of transnational, inter-cultural and interdisciplinary exchange and meaning-making. For example, in The Ballad of Sand and Harry Soot, co-authored by Stephanie Strickland and Janet Holmes (1999), unique poetic text is brought into contact with digital artworks ‘to create a web of relations with limitless potential for diverging and converging series of readings’ (p. 76). Together, these chapters flesh out the dynamic and potentially radical implications of new media for conceptualising, and transforming, the complex power relations in which gender and culture are relationally (re)constituted at the intersection of postcoloniality, transnationality and neo-liberalism. The book's final chapter engages with the concept of ‘technocracy’ through a critical reading of Neal Stephenson's The Diamond Age. Odin lauds Stephenson's exposure of technology as ‘embedded in its own ideological bias’ in the context of global capitalism, yet sees little of transformative value in his perspective. He acknowledges no ‘need for any concrete political chance to eliminate oppressive mechanisms of society from the ground up’ (p. 128), and is ultimately ‘guided by the dominant narrative based on the cybernetic construction of the human’ (p. 3). While incisive in its critique, this chapter might have worked better at the beginning as a means to introduce the concept of technocracy, before showing how the selected female authors employ new media to critique dominant technocratic narratives in different and disruptive ways. The book also would have benefited from a concluding chapter considering the critical implications of these hypertext works for wider analyses of embodiment, culture, relationality, transnationality, new media, technology and neo-liberalism. This might have provided a fruitful opportunity to link the book's key concerns with postmodern topographies to what might be referred to as ‘post-post-modernism’, for example by gesturing towards the significance of ‘the ontological turn’, ‘the affective turn’ and ‘the new materialism’—and the questions, challenges and complements they might present to the paradigm shift Odin envisions. On the whole, Odin has succeeded in writing an imaginative and critical book that pushes forward current debates about new media, culture, power and embodiment in important ways. Hypertext and the Female Imaginary will no doubt be of significant interest to students and scholars working across a broad range of disciplines who are concerned with how electronic media might aid feminist and postcolonial efforts to radically re-imagine and re-make the world.